Over 20 Guns, Hundreds Of Ammo Rounds Found At Home Of Man Who Vowed To Kill Journalists [VIDEO] - Joe.My.God. 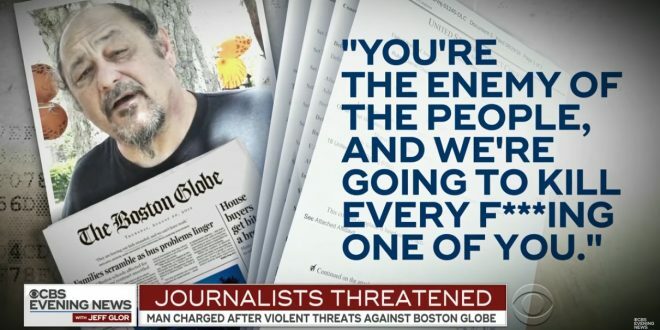 California man who made a series of calls to the offices of The Boston Globe threatening to kill journalists was ordered released on bond by a federal judge Thursday despite the objections of prosecutors who painted him as a danger to his community. While waiting to be called before Magistrate Judge Paul Abrams, 68-year-old Robert Chain sat in a chair flanked by U.S marshalls, arms crossed and repeatedly tilting his head down into his hands. Federal agents arrested Chain at his home early Thursday morning where they also confiscated over 20 firearms – including a shotgun behind the front door and handguns stuffed in sock drawers – and hundreds of rounds of ammunition, prosecutors said Thursday in federal court in Los Angeles. According to court documents filed Wednesday in federal court in Boston, Chain made 14 threatening phone calls to the Globe’s newsroom between Aug. 10 and 22 in retaliation for the paper’s request that news media outlets condemn President Donald Trump’s attacks on the press. NBC News: According to the criminal complaint Chain threatened to travel to The Boston Globe and kill newspaper employees.